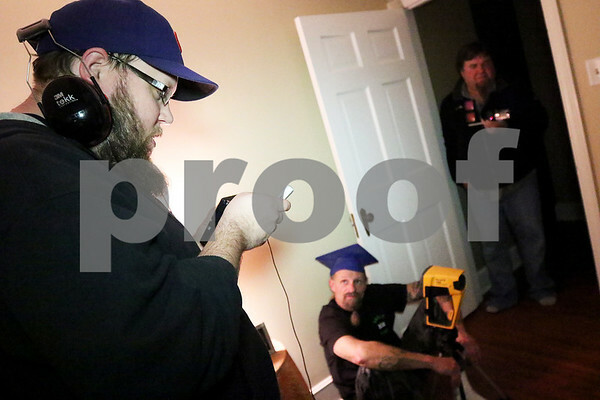 From left: Members of Ghost Head Soup, a paranormal investigative group in DeKalb County, Tim Schmuldt, Michael Minard and Dean Thompson investigate a Sycamore client's bedroom for paranormal activity on Friday, October 30, 2015. Schmuldt was utilizing a modified scanning radio, Minard was using a thermal imaging camera, and Thompson a night vision camera. Some historical digging, revealed that a Dolores Nelson lived in the house in the 1940's and died several days before her 1944 graduation from Sycamore High School.